One of my other resolutions this week for my librarianship world is to review more books. I am not very good about in depth reviewing, I have never been. Hopefully, by writing in public about books that I read my writing and book reviewing will get better. 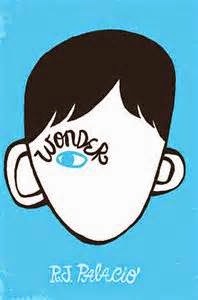 "Wonder" by R.J. Palacio. Published in 2012. "My name is August. I won't describe what I look like. Whatever you're thinking, it's probably worse" This is the statement on the back cover of the book, enticing readers with a mystery. August Pullman is like any other 5th grader. He has a dog named Daisy, an older sister, and an obsession with everything Star Wars. Except August has a rare craniofacial deformity that makes it hard for people to see past his face. August has been home schooled all his life until his parents decide that he needs to experience school his 5th grade year. August is understandably nervous about this decision and quickly finds out which kids in his new school actually want to be his friends and ones that are just being nice on the surface. This book is told from several different character viewpoints including August's sister, his friend summer, his sister's friend and boyfriend and even someone August thinks is his worst enemy. This book is fantastic in showing and proving that concrete cliche "don't judge a book by it's cover", and even the smallest and most vulnerable among us can have great courage.